Be the first to share your favorite memory, photo or story of Mildred. This memorial page is dedicated for family, friends and future generations to celebrate the life of their loved one. 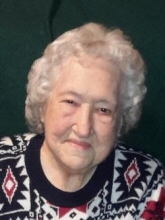 Mildred Marie McCrory departed this life on 26 March 2017 in the comfort of her home. She was 93 years, 9 months and 1 day old, being born in Blackwell, Kay County, Oklahoma on 25 June 1923 to George Wilson White and Delia Lee (Bunker Shoemaker) White. Mildred attended the Blackwell Public School System, and when high school was complete, she went to the Oakland, California area working as a nanny and also at a GE production facility. After several years she returned to Blackwell and worked at the Boeing aircraft factory in Wichita, Kansas during WWII. Following the war she began working as a telephone operator for the Southwestern Bell Telephone Company's office at Bridge and First Streets in Blackwell and continued that position until Blackwell built a new telephone office and went to dial operations about 1963. After WWII she met again a childhood friend, Samuel Omar McCrory and they were subsequently married on 17 March 1946. In 1964, she joined some of her friends who were making wedding cakes and hosting wedding receptions. Mildred continued this interesting and fun enterprise after the others retired. She enjoyed this activity very much. She had hobbies including Avon and kept many in stock of their favorite cosmetics as the "Avon Lady". She also loved to bake. She made many delicious things (Glazed Cinnamon Rolls) for her family and children's friends who were there. In later years, Mildred enjoyed her volunteer work at the "Top of Oklahoma Museum", greeting visitors, guiding tours through the museum, and telling of the unique history of Blackwell and the surrounding area which she loved. Mildred and her family were life long members of the Blackwell Branch of The Church of Jesus Christ of Latter-Day Saints. Mildred held many offices and devoted much time and energy to the Christian efforts of her faith. One of her fondest memories was to see a Temple of her faith built in Oklahoma in her lifetime. Above all else she loved all her family and was loved in return. She always had words of encouragement and solace to her family, friends and strangers, this will be missed. She was preceded in death by her husband, Samuel Omar McCrory, Jr in 2008, parents, George and Delia, her sisters, Sylvia Lee Green and Mary Lou Hagerdon, half brothers Orville Vere Shoemaker, Henry Voyle Shoemaker, Paul Robert Shoemaker, and Herbert Shoemaker, and half sister Eunice Shoemaker Longan. She is survived by sons, Rodney Omar McCrory and wife, Donna Starr of Shawnee, Oklahoma and Timothy Irvin McCrory of the home, daughters, Jorja Denise Clouse and husband, George Edward Clouse of Marland, Oklahoma, and Samie Kay Newland of Colorado, 12 grandchildren, 22 great-grandchildren, and 1 great great-grandson. A funeral ceremony to celebrate her life will be held at Trout Funeral Home of Blackwell on Friday, March 31, 2017 at 2:00 p.m. Friends and family may come by the funeral home to pay their respects on Thursday, March 30, 2017 until 8:00 p.m.
To send flowers or a remembrance gift to the family of Mildred Marie McCrory, please visit our Tribute Store. "Email Address" would like to share the life celebration of Mildred Marie McCrory. Click on the "link" to go to share a favorite memory or leave a condolence message for the family.